TCA received the Advisory Council for Bosnia and Herzegovina’s (ACBH) Friendship Award at its 10th Anniversary Gala on February 25, 2017. 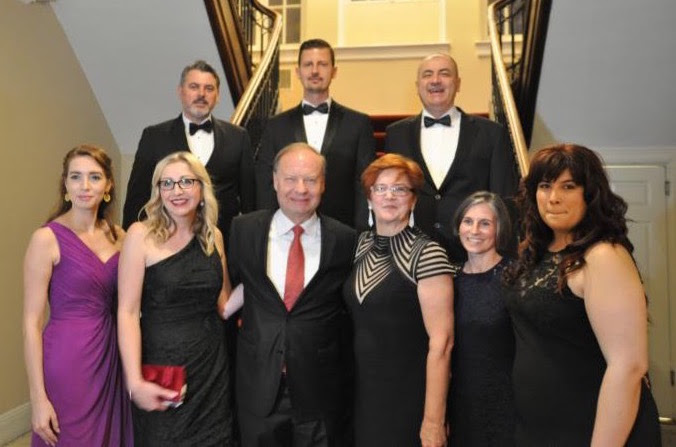 The ACBH Gala also celebrated the 25th anniversary of the U.S. recognition of Bosnia and Herzegovina’s (BiH) independence. Also honored at the event for their support of BiH were former Vice President Joseph R. Biden, Jr., who also served as the Gala’s keynote speaker, and former Senator Robert J. Dole. ACBH is the leading independent, non-governmental organization dedicated to promoting the interests of Bosnian Americans and advocating for a united, multi-ethnic and democratic BiH. TCA’s long relationship with ACBH began in 2008 with a $150,000 matching grant to support ACBH’s work in Bosnian American advocacy. A TCA $100,000 grant was given in 2014 to the Marshall Legacy Institute (MLI) for the removal of land mines in BiH. This was matched by a $100,000 grant from the Office of Weapons Removal and Abatement of the U.S. State Department. In 2016 a $5,000 TCA grant supported an ACBH delegation visit to Washington, DC from two Bosnian advocacy organizations, the Association of Victims and Witnesses of Genocide and Mother's Action of the Srebrenica and Zepa Enclaves. Since 2008, TCA has provided 11 scholarships to Bosnian American students who study abroad in Turkey and BiH; supported several Bosnian Americans congressional internshipsin Washington, DC; and sponsored three Congressional Delegations to BiH (2010, 2012, and 2015). TCA also provides office space to ACBH.